If there's one big thing to take away from Oculus Connect 2, it's that the biggest companies behind virtual reality mean to make it "a thing" through sheer force of will. At the second-annual Oculus developers conference, the company showed off a variety of content initiatives-from new games to aspects like social connection, mobile VR products, partnerships and apps. Oculus, Facebook, Samsung and various developers mean to deluge consumers with ways they can use their VR gear, in hopes of making the devices so appealing, you'll be dragged into the hype along with the existing VR true believers. It's hard not to get swept up in the infectious excitement. "It's you guys who are making the experiences that are going to light this up and make it (VR) an incredible product," Oculus CEO Brendan Iribe told developers from the stage of the Oculus Connect 2 keynote presentation. The truth of VR still seems to be somewhere in the middle. Don an Oculus headset and you'll find yourself excited by the possibilities of present in the technology. But the barriers to entry-cost, space, equipment, wearing a screen on your face that cuts you off from the world-are still there, and Connect 2 was a big reminder of the challenges VR faces, even as Oculus showed off the coolest stuff made for its platform to date. The star of the show was arguably Oculus Touch, the tech that takes VR from being just a 3D screen attached to some goggles to an experience within which you actually feel present. Touch is a pair of goofy looking controllers that wrap around your hands-imagine pistol grips akin to the Nintendo Wii's nunchuck controller and you're on the right track. 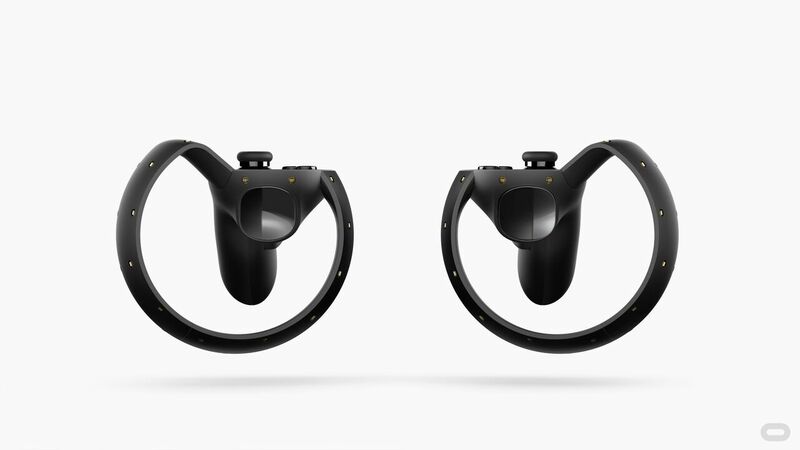 The controllers are meant to mimic your hands, and paired with a camera that tracks your motion, gives you the ability to grab stuff in VR. The controllers are simultaneously a strange thing to adapt to and surprisingly intuitive. A trigger button acts as your index finger in VR; another under your middle finger simulates opening and closing your grip when picking up objects. Thumbsticks and face buttons round out the controller, bridging a traditional gamepad with an interface that's meant to represent your actual hand. Oculus has done a great job of making this work as you interact with imaginary objects visible on the screen. It takes a little getting used to when picking up things by tapping a button with your middle finger, but the controller in your hand gives your brain the sense you're actually gripping the thing you've reached for. Spectral hands on screen help you feel like the 3D virtual space projected to your eyes is actually somewhere you're existing within, and gives the right sense of distance and depth you need to be able to grab the object you want, and not the one you don't. Touch is best demonstrated with the Oculus Toybox demo, which is full of random little objects you can grab and utilize. In addition to on-screen hands, Toybox also represents your head, thanks to the tracking camera, so when you enter the space with a second person, you feel like you're really interacting with them. And Toybox is full of cool little proof-of-concept ideas that demonstrate the potential of Touch. In Toybox, you can stack blocks, play tetherball, bat balls back and forth with make-believe ping-pong paddles, and more. There are a mess of objects available in the demo, and a few even get pretty meta. Pick up what looks like an Oculus Touch controller in Toybox and you can drive around a radio-controlled tank, aiming and firing its cannon with a laser sight projected out from your hand. It all feels pretty solidly like you're manipulating the objects in the real world, without that uncanny weightlessness feeling that comes with waving your hands at fake items as you might with Xbox's Kinect controller. The demo even comes with a shrink ray: use it on your partner and they wind up small, with an appropriate change in perspective. When my demo-giver hit me with the ray, I found his head avatar became enormous, and even his voice became deep and booming, like I was suddenly interacting with a giant. It all suggests some really cool possibilities that come with VR, even if Toybox is just that: a little distraction you probably wouldn't spend more than 10 or 15 minutes with if you had it at home.